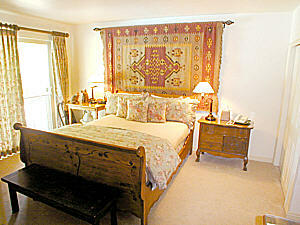 Just off the pool, the Garden Room has a queen-size sleigh bed. Soft floral prints and a metal garden wall sculpture bring a garden feeling into this room. The room offers a private bath, small television with VCR, access to video library, wireless internet, in-room telephone and a small refrigerator.